Receivers aren’t simply more important to fantasy owners than ever before—they’re also more reliable. It was a banner year for receivers in 2015, with six scoring more than 200 points in standard-scoring fantasy leagues for the second straight season. It was the first time in the history of the fantasy game that there were more 200-point receivers than running backs, signaling the official end of the RB position’s dominance over the fantasy game. It didn’t stop at the top of the overall scoring leaderboard, either. You could draw a line at 175 points or 150 points or 100 points, and you would find more receivers than backs north of all of those lines. Receivers have flipped the script and are now every bit as indispensable to fantasy owners as running backs. Receivers aren’t simply more important in today’s NFL, with strategic innovations and rule changes making passing games more effective than ever. They’re also more reliable. Everyone expected Antonio Brown, Julio Jones, Odell Beckham Jr. and DeAndre Hopkins to be among the fantasy leaders at the position, and they were, accounting for four of the six 200-point totals in 2015. The other two, Brandon Marshall and Allen Robinson, were both popular selections, as well. This year for the first time in fantasy history, the top three picks by average draft position might all be receivers. If you want the elite at the position, you better hope you have an early pick or be ready to spend top dollar in your auction. The good news is the position has become deeper up and down the rankings, something we’ll dive into later in the summer. For now, let’s focus on the top 10. This might seem low for a receiver who had 1,400 yards and 14 touchdowns last year and will turn 23 about two weeks before the season begins. But this is less a commentary on Robinson than a concern over the state of the Jaguars. Jacksonville made significant defensive upgrades, drafting Jalen Ramsey and Myles Jack, and signing Malik Jackson. 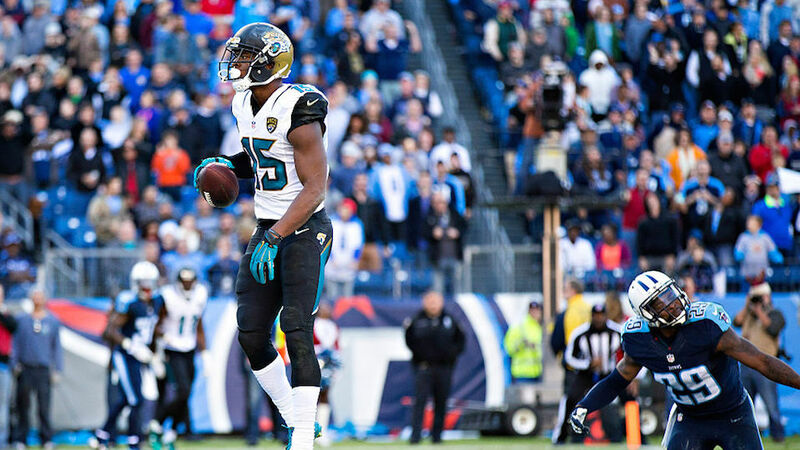 They’ll also get last year’s first round pick, defensive end Dante Fowler, in the fold for the first time after he missed all of last season with a torn ACL. The Jags also strengthened their running game, signing Chris Ivory away from the Jets. In short, they should be a lot more competitive this season, and that’s bad news for Robinson’s fantasy value, as well as that of Blake Bortles and Allen Hurns. Robinson was eighth in the NFL with 153 targets last season, while Bortles attempted 606 passes. That’s going to happen when a team is 24th in total defense and 31st in points allowed. Jacksonville’s defense can’t help but improve, and there’s a real chance it’s much better than it was last season. 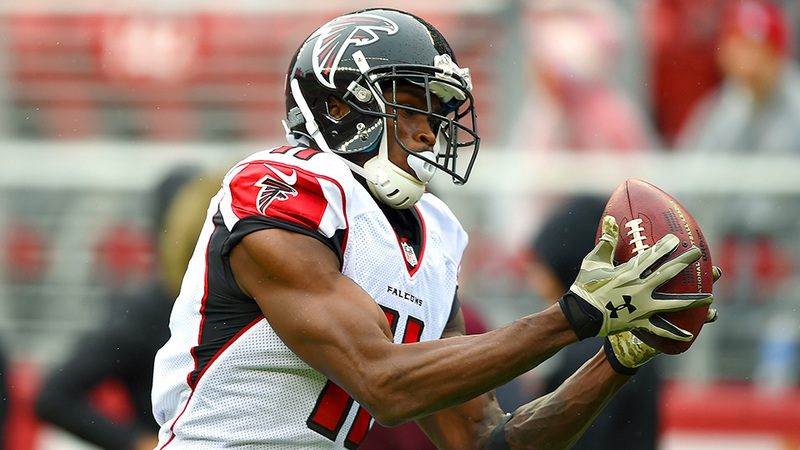 Robinson is a safe WR1, but no one should expect him to repeat last year’s numbers. Jeffery missed seven games due to injury last season, but when he was on the field he proved himself capable of being a WR1. Freed from Brandon Marshall’s shadow for the first time in his career, Jeffery caught 54 passes for 807 yards and four touchdowns in nine games.. Last year’s first round selection, Kevin White, will finally make his NFL debut after missing all of 2015 because of a shin injury, but there’s no question who will be Jay Cutler’s favorite receiver. 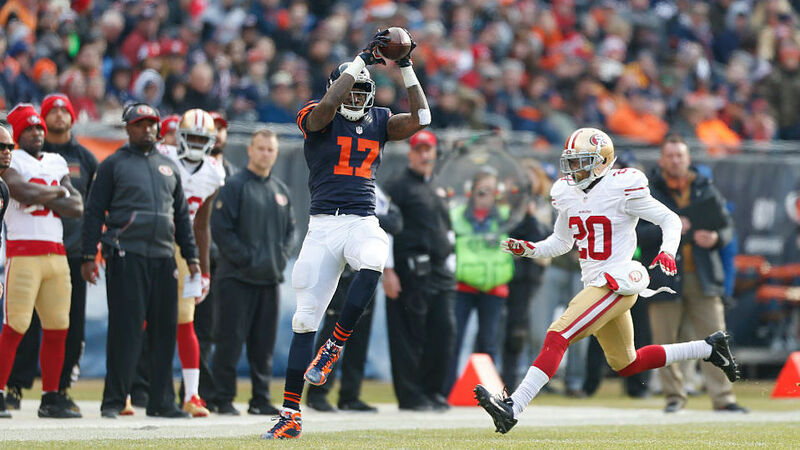 We saw just how lucrative a status that can be for a talented receiver during Marshall’s first two years in Chicago, a fact Jeffery learned while he was getting the short end of the stick. The Bears lost Matt Forte and Martellus Bennett during the off-season, and while a John Fox team may skew more run-heavy than others, Jeffery still has a very real chance to lead the league in targets. He can win jump balls, a key for any Cutler favorite, and is the team’s best weapon no matter where the offense is on the field. Many misinformed fantasy owners believe Evans was a disappointment last year. If you look simply at Evans’s cosmetic numbers and compare them to his rookie year, you can spin an argument supporting the theory that he let his owners down last season. That theory, however, is based entirely on the fact that he had three touchdowns after hitting paydirt 12 times as a rookie. It also conveniently ignores the reality that receiving touchdowns are among the most volatile, hard to predict statistic in football. Just ask Andre Johnson, who has never had a 10-touchdown season. Or Calvin Johnson, who had five or fewer touchdowns three times in his career, including his record-setting 1,964-yard season. Evans set new career highs in receptions (74), yards (1,206), yards per catch (16.3) and targets (147), He was the only 1,200-yard receiver with fewer than six touchdowns last year. The two receivers nearest him on the yardage leaderboard—Larry Fitzgerald (1,215) and Johnson (1,214)—both found the end zone nine times. Evans’s lack of touchdowns was an anomaly that will correct itself this season. It’s only intuitive that as Jameis Winston matures and improves as a quarterback, Evans’s fantasy prospects will brighten. His size makes him a lethal red-zone weapon, and that’s the final piece to the puzzle. Evans has legitimate top-five upside at the loaded receiver position. Bryant lost most of 2015 after breaking his foot Week 1. By the time he returned, Tony Romo was all but done for the year and the Cowboys season was effectively at its end. I must admit, it feels wrong ranking Bryant this low. Before last season, he had three straight years with at least 1,200 yards and 12 scores. His average output across that span was 91 catches for 1,311.7 yards and 13.7 touchdowns, which comes out to 213.37 points in standard-scoring leagues. Even in last year’s historic year for receivers, that would have made Bryant the seventh-ranked player at the position. For fantasy purposes, though, we have to evaluate players based on their real-life context. The Cowboys have seemingly legitimate Super Bowl aspirations, but we saw what happened when Romo went down last year. They have no shot of winning anything without him, and he’s now a 36-year-old who has fractured his left collarbone three times. The Cowboys drafted Ezekiel Elliott with the fourth overall pick in part because they believe him capable of taking some pressure off of Romo and the passing game. Even when Bryant was at his best, he was never a yardage monster. His opportunities could be fewer this season than at any other point of his career. Hopkins enjoyed a true breakout season last year, finishing third among receivers with 111 receptions and 1,521 yards, and sixth with 11 touchdowns. That he did this while playing the entire season with the quarterback quartet of Brian Hoyer, Ryan Mallett, T.J. Yates and Brandon Weeden not only underscores how good he was, but also breeds confidence for the first year of the Brock Osweiler era. Hopkins benefited from 192 targets last season, third only to Julio Jones (203) and Antonio Brown (193), and that’s not likely to change this season. 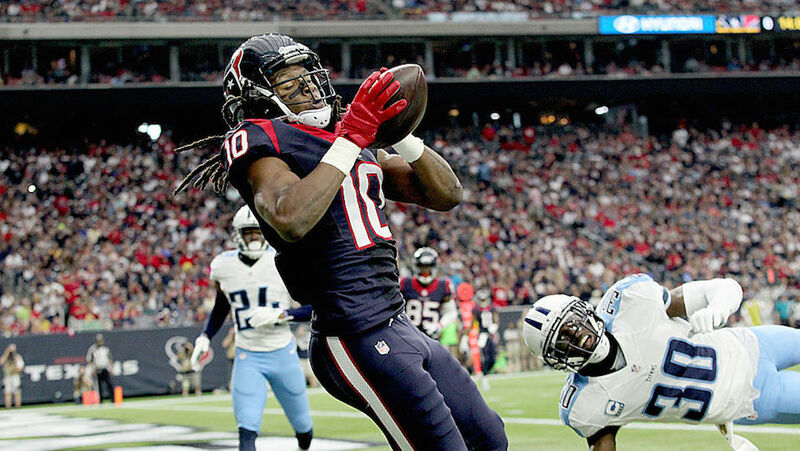 Houston’s receiver depth chart behind Hopkins is a motley crew of youngsters and past-their-prime veterans, featuring Jaelen Strong, Will Fuller and Cecil Shorts, while the tight end duo of Ryan Griffin and C.J. Fiedorowicz won’t steal away too many looks, either. A completely healthy Lamar Miller will command more share of the offense than the backs who replaced Arian Foster after his injury last season, but the presence of a legitimate run game makes the Miller addition a net positive for Hopkins. If you miss out on the big three, you will not be disappointed with Hopkins as your No. 1 receiver. He deserves first-round consideration, and should be one of the most expensive players in an auction. Is Green the NFL’s quietest superstar? The sixth-year player out of Georgia has never had fewer than 1,000 yards and six touchdowns in a season, and both of those low points came in 2014 when he missed three games and was never 100% after suffering a foot injury in Week 1. In his three fully healthy, non-rookie seasons to date, he averaged 93.7 catches for 1,357.7 yards and 10.7 touchdowns. Like DeAndre Hopkins in Houston, Green is at the top of a receiver depth chart in Cincinnati that is largely faceless behind him. While Tyler Eifert emerged last season, it is Green who will command the bulk of Andy Dalton’s attention. Green is as steady as they come, and while he may not have the ceiling of players ranked ahead of him, or, for that matter, a couple of the players behind him, he does have one of the safest floors at the position. You can pencil Green in for 85 catches, 1,300 yards and 10 touchdowns, which would easily make him a WR1. Consistency and bankability are crucial at the top of the draft, and you’ll get both in Green. Nelson has two red flags that might as well have alarms and sirens attached to them: 1.) He’s 31 years old and 2.) He’s coming off an ACL tear that cost him the entire 2015 season. The age isn’t really a concern on its own. We have recent examples of Terrell Owens, Randy Moss and Marvin Harrison posting monster seasons at 31 or older. At that age, however, it’s a bit harder to rehab an ACL tear than when you’re in your mid-20s. While Nelson unquestionably has his work cut out for him, if he proves to be the player he was before the injury, he’s going to be a top-five receiver this season. Remember, when we last saw him on the field for a full season, he had 98 catches for 1,519 yards and 13 touchdowns. He’s a premier deep threat who still doesn’t get enough credit for his imposing presence. Julio Jones is unanimously viewed as one of the toughest covers in the league thanks to a 6 ’ 3” and 220-pound frame. Nelson checks in at 6 ’ 3”, 217 pounds. Don’t forget who’s on the other end of all those passes Nelson catches, either. Aaron Rodgers desperately missed Nelson last season, and the two of them are once again primed to wreak havoc on the secondaries they face this season. 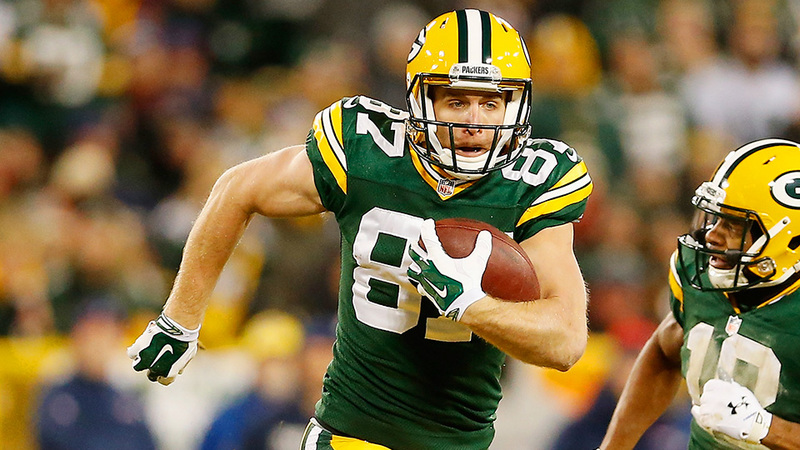 In the last 24 games started and finished by Rodgers, Nelson has 147 receptions for 2,329 yards and 20 touchdowns. That translates to 6.12 catches, 97.04 yards and 0.83 touchdowns per game, which is good for 14.68 fantasy points per game in standard-scoring leagues, or 234.88 points across a 16-game season. 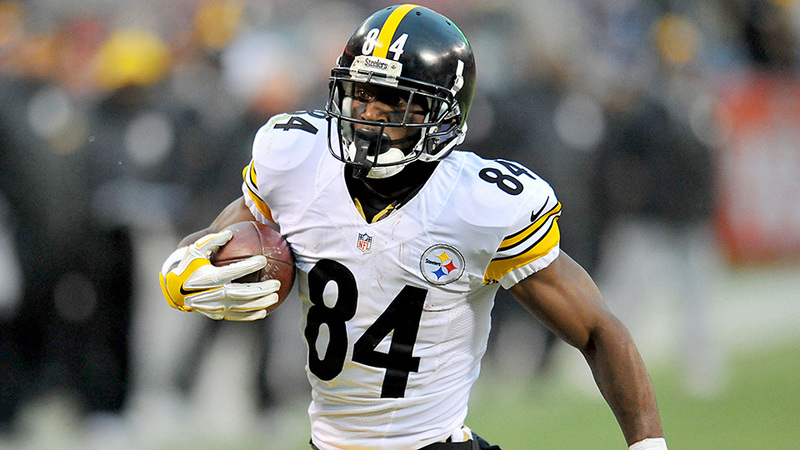 For comparison’s sake, Antonio Brown scored 242.2 fantasy points last year. Jones ushers in the portion of the rankings where you can justify ranking any of the remaining players as the best fantasy receiver on draft day. 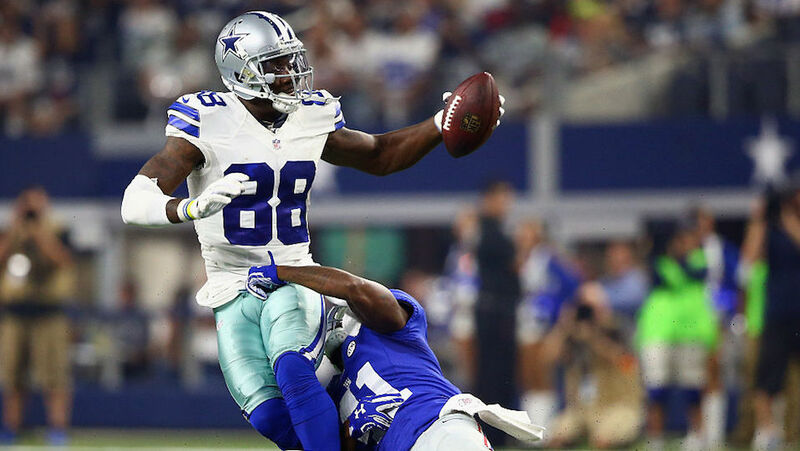 Jones led the NFL with 1,871 yards last year, and tied with Antonio Brown for the league lead in receptions with 136. He had just eight touchdowns, largely a reflection of the ineffectiveness of the Atlanta offense as a whole, as well as the fact that he shared a huddle with fantasy’s No. 1 running back, Devonta Freeman. It’s the touchdown bugaboo, however, that keeps Jones behind Antonio Brown and Odell Beckham in my rankings. As talented as Jones is—and make no mistake, from the standpoint of raw talent there’s no receiver better in the league—he has just one double-digit touchdown season in his five-year career. 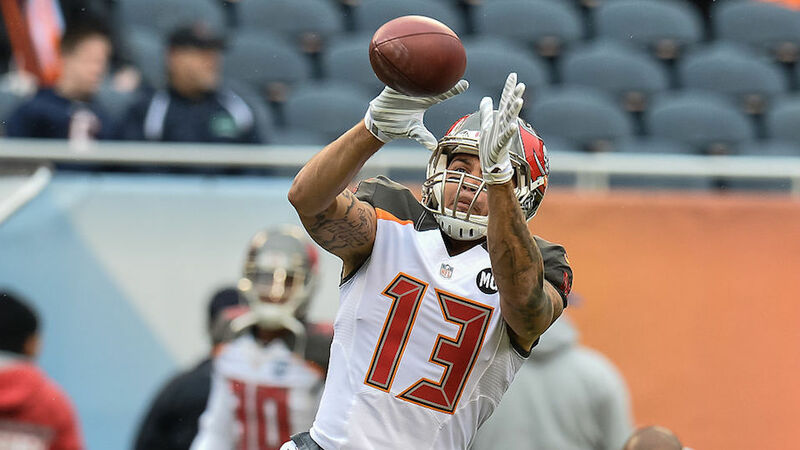 We discussed receiving touchdown volatility with respect to Mike Evans earlier, but eventually a pattern becomes hard to ignore. Jones is getting dangerously close to that territory. Beckham has nine fewer touchdowns than Jones despite playing 38 fewer games. That Jones remains, without question, one of the three best fantasy receivers in the league speaks to his raw talent and unparalleled ability to rack up yardage. Jones seems to have a reputation for being injury prone that stems entirely from the 11 games he missed in 2013 after breaking a bone in his foot. He has missed a total of four games in his four other seasons, and has played in 31 of 32 over the last two years. Jones is a worthy top-five pick, no matter your format. 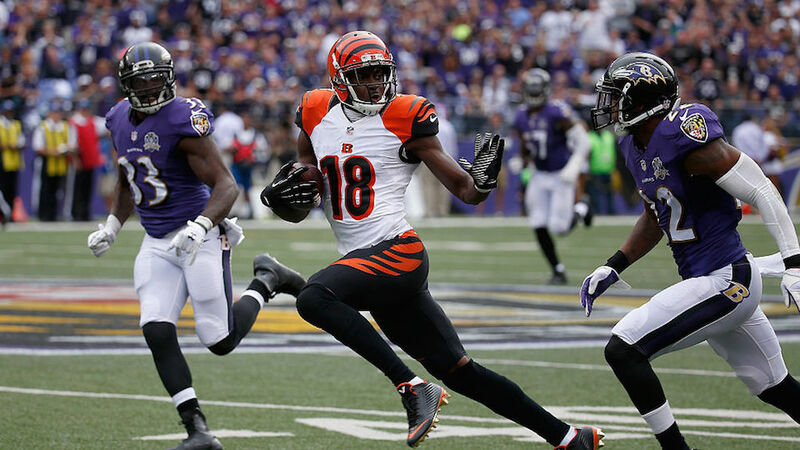 The best fantasy wide receivers, No. 2: Odell Beckham Jr.
Beckham had quite the debut season to live up to after he hauled in 91 passes for 1,305 yards and 12 touchdowns in just 12 games as a rookie. He did not disappoint, racking up 96 receptions for 1,450 yards and 13 scores in 15 games. Not including his modest rushing totals, Beckham has averaged 15.76 fantasy points per game in standard-scoring leagues in his career. That per-game average would have made him no worse than the No. 2 receiver in any season going back to 2000, and the top receiver in nine of those years. If that’s not enough of an endorsement for Beckham I’m not sure what is, but I can try to convince you. He and Antonio Brown have been 1-2 in points per game both of the last two years, flipping spots from 2014 to last season. He’s the only receiver with at least 12 touchdowns in both of those seasons. 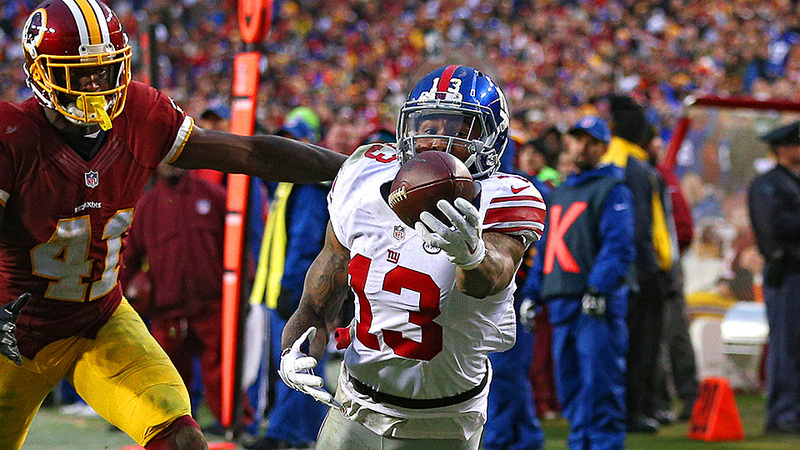 Beckham is one of three receivers who had an 80-yard catch in 2014 and 2015, with the others being A.J. Green and Martavis Bryant. All Beckham has done since making his debut in October of 2014 is every single thing a fantasy owner could ask of a receiver. The Giants, meanwhile, had one of the least inspiring run games in the league last season, and, while they added Paul Perkins in the draft, could be among the league trailers in rushing efficiency again this year. Beckham might break the 200-target mark this season, and that sort of volume could make him the best player in all fantasy formats. Where does one even begin with Brown? Three years ago, he caught 110 passes for 1,499 yards and eight touchdowns. He improved across the board in 2014, pulling down 129 grabs for 1,698 yards and 13 scores. Brown improved in two of those stats last season, nabbing 136 catches for 1,834 yards, but falling back to 10 touchdowns. He has put together the finest three-year stretch we’ve seen from a receiver since Jerry Rice was in his prime, and the former is only 28 years old. Brown is remarkably consistent, scoring fewer than than six fantasy points in six games over the last three years, three of which Ben Roethlisberger missed due to injury. In fact, if you look at only the 12 games Roethlisberger played last year, Brown was on a 16-game pace for 158.7 catches, 2,132 yards and 13.3 touchdowns. He’s capable of winning fantasy games singlehandedly, which he displayed when he caught 17 passes for 284 yards in a win over the Raiders last season. With all due respect to Odell Beckham and Julio Jones, Brown’s track record, age and offensive environment in Pittsburgh make him the No. 1 fantasy receiver heading into the 2016 season. Not only is he the top choice at his position, Brown is the best overall player in the game. If you’re lucky enough to have the first pick in your draft this season, you should be using it on No. 84 from Pittsburgh.